Charlotte "Charlie" Quinn is a twenty-something struggling lawyer. She and her husband have agreed that they want a family but feel that it's best to wait until they have more of their debt paid down -- student loans, car loans, etc. before thinking of starting a family. The only problem with that is Charlie may be pregnant now. Rather than focus on her possible pregnancy, she turns her attention to what initially seems like a slam-dunk case for emancipation by a Girl Scout and supposedly straight-A honor student, Florabama "Flora" Faulkner. The only problem with that is Charlie is taking everything Flora says at face value without doing any due diligence. When her client is arrested and others begin to poke and prod into Flora's life, what is uncovered is definitely more than Charlie was counting on. The question soon becomes just how far is too far when it comes to protecting a client? Last Breath by Karin Slaughter is a quick read and one that has just as many twists and turns as her full-length reads. This might be a short read but it packs a powerful punch. Charlie Quinn is missing her mother and comes across a teenage girl that also lost a mother and in need of legal counsel. Is it possible that Charlie is too focused on the similarities between herself and Flora to notice the problems with Flora's story? Is it possible that Charlie is being played by this teenager or is there something more sinister at work? No, I'm not going to tell you the answer to any of those questions, read the book! If you enjoy well-crafted mysteries, then you'll definitely want to grab a copy of Last Breath to read. I've read and enjoyed everything Ms. 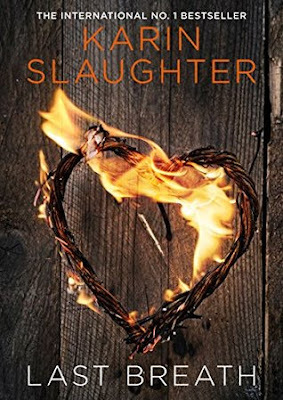 Slaughter has written, including Last Breath, and I'm looking forward to finding out what happens next with Charlie Quinn in The Good Daughter. Disclaimer: I received a free digital review copy of this book from the publisher for review purposes via Edelweiss+. I was not paid, required, or otherwise obligated to write a positive review. The opinions I have expressed are my own. I am disclosing this in accordance with the Federal Trade Commission's 16 CFR, Part 255: "Guides Concerning the Use of Endorsements and Testimonials in Advertising." I agree with you. After reading this book I am anxiously waiting to read THE GOOD DAUGHTER! Great review.